Publication details: DVD. 2005. 0 pages. Publication date: 2005-08-17. Interactive computer DVD (Windows compatible), containing the entire book (xii and 414 pages with 1193 illustrations, of which 1142 in full color, and 12 tables) and hours of live surgery video. After the first edition, which was published in 1993, and the second edition with interactive CD ROM, published in 1998, this third edition is even more extensive, containing six new chapters: Septal surgery basic techniques; New concepts in reconstructive septoplasty; Developments in the open rhinoplasty approach; Ethnic rhinoplasty; Batten grafts for nasal valve collapse; and Nasal reconstruction. Moreover, a sophisticated new interactive DVD has been developed in cooperation with the Audio Visual Center at the University of Amsterdam. Its goal is to provide a practical guide with the maximum impact on teaching. The DVD contains more than two and a half hours of live surgery and there are short video clips on specific surgical techniques to complement the various chapters. 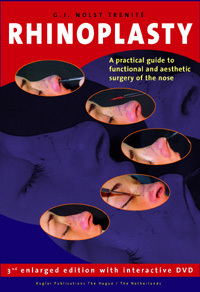 The many positive reactions from all parts of the world regarding this practical guide to functional and aesthetic surgery of the nose, which has helped colleagues improve their surgical skills, have been a huge stimulus. Once again, I sincerely hope that this third edition, with its interactive DVD that explicitly shows most of the modern techniques in rhinoplasty, will be of benefit to surgeons who wish to improve their skills in rhinoplasty, which today still remains the most challenging and difficult surgical procedure in plastic surgery of the face.